Mother Nature may have a plan to end February, and Meteorological Winter, with a bang. However, more of a spring-like bang than a winter-like bang. A strong storm system is expected to move across the United States over the next 60 hours. Currently, the upper-level low is located a couple hundred miles off the west coast. It is expected to be in the Rocky Mountains Tuesday morning and over Nebraska/Kansas Tuesday evening. Ahead of the storm, winds will turn back around to the south and begin to transport moisture (and warmer temperatures) in the lower portions of the atmosphere to the middle Mississippi Valley. Forecast models are bringing strong jet stream winds through the Plains and Midwest early Wednesday morning. Pictured above is the wind forecast at 300mb (the jet stream) at 6am CT Wednesday morning as predicted by the NAM forecast model. 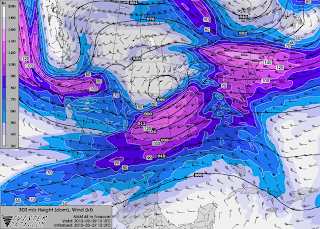 A strong jet streak (wind maximum) is located from northwest Illinois through northwest Oklahoma. This model is showing an area of diverging winds setting up over southeast Missouri, southern Illinois and western Kentucky at the forecast time (6am CT). The NAM also has a decent amount of instability forecast to move through the Mississippi Valley and Ohio Valley Wednesday morning. On the flip side, the GFS model is a little more bearish on the threat of severe weather. The model is suggesting there will be very little instability. I should say that the NAM has been a little overboard with systems the last couple weeks so I am hesitant to get too excited. The Storm Prediction Center is keeping an eye on it. They have southeast Missouri, southern Illinois, western Kentucky, northwest Tennessee, northeast Arkansas included in a "Slight Risk" for Tuesday night through Wednesday morning in their latest Day 2 Outlook. They include a big portion of southern Indiana, Ohio, Kentucky and Tennessee in their Day 3 Outlook which covers the time from 6am CT Wednesday through 6am CT Thursday. Right now it appears to me that a line of thunderstorms, capable of producing damaging winds, hail and perhaps a tornado will develop during the overnight hours Tuesday-Wednesday. The line will quickly move to the east at 50mph-60mph. To be honest, I have not completely bought in to the severe weather threat yet. Something feels "off" about the setup. To me it feels like the jet streak isn't lining up where I would like to see it for big severe weather. That being said, this morning's NAM is much closer to where I'd want to see the jet streak located. Models are also suggesting a large cloud shield moving in for Tuesday. This isn't one of those storms where we need to see a lot of sunshine to make things more unstable, but sun would definitely help make things more unstable. I am also questioning the amount of moisture that will be able to return to the area. As of 11am CT this morning, dew points were ranging from the 20's to lower 30's. We will need to see the dew points get back to the 50's to make it work out. Will there be a watch issued? It is a little too early to say with certainty, but I'd guess "yes" at this point. Will this be a wide spread severe weather outbreak? At this point I'd say "not likely". Even though I am slightly downplaying the severe weather threat one concern is that it will likely move through southeast Missouri, southern Illinois and western Kentucky during the overnight hours. That means people will be asleep which is always a concern. When storms move through overnight people are less likely to be aware if a warning is issued. Be sure to turn on your NOAA weather radio before you go to bed. If a warning is issued, you will know about it and you can take appropriate action. Having said that, be sure to check the batteries in your radio. Is your radio still working? Just give it a once over today so you don't have to do it tomorrow. For those of you in Indiana, it looks like the threat will move through as a thin line of storms mid-morning Wednesday. The main threat would be damaging winds and perhaps a quick spin up tornado. My gut feelings are much the same as I posted for the other areas above. I don't think everything has lined up just yet. What happened? We went from not certain to a deadly tornado outbreak.